Born and raised in Penang, I am practically a living and walking food guide when it comes to eating Penang hawker food or street food. As requested by many readers, I have finally put together this comprehensive “An Insider’s Guide to Penang Hawker Food” to give you the insider’s tips about the where, what, and who of the best of the best in Penang hawker food scene. Rasa Malaysia runs a private Penang culinary tour where we take you to sample the best of Penang food plus local culture tour: legendary hawker food, street food, local wet markets, fruit and spices orchards and plantations, belacan (prawn paste) manufacturing plant, Nyonya food, home-stay meals, private cooking class, and more! If you are interested, please email me to inquire further. Or, you can read all about it here. Noodles in tangy and sour fish broth served with fresh vegetables such as mint leaves, onions, cucumber, lettuce, pineapple, red chili, and bunga kantan (torch ginger bud). 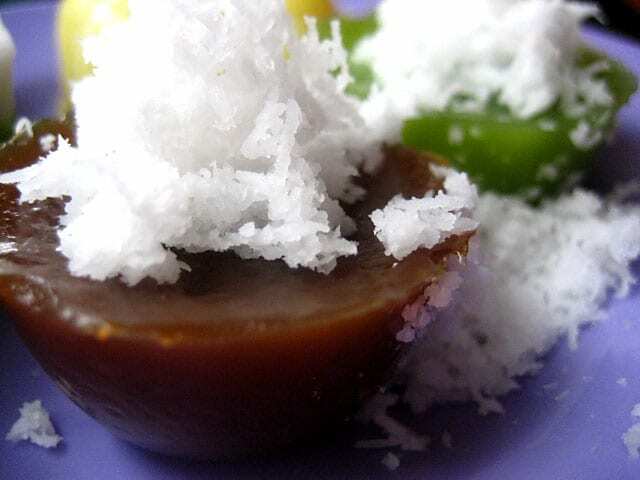 A spoonful of Hae Ko (a dark and thick prawn paste) brings out the essence of this ever popular Nyonya creation. This is the most famous Laksa stall in Penang. 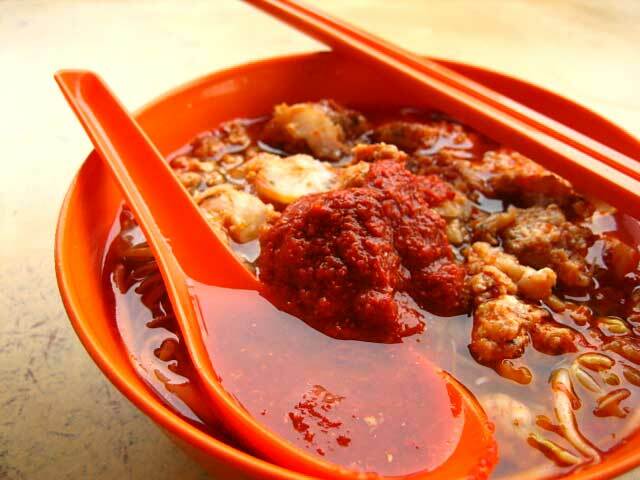 Managed by a father-son team: Ang Kak Seong and Ang Kar Foo, this Laksa is a must try! A popular noodle soup with spicy broth made from prawn shells and heads. Served with slices of hard-boiled eggs, shredded prawns, water convolvulus, pork, crispy fried shallots and a spoonful of chili paste. Yellow noodles and vermicelli infused in rich and spicy coconut curry and with cubes of pig’s blood, cockles, fried tofu puffs, cuttlefish, and shrimps as toppings. Penang Curry Mee is unlike Curry Mee / Curry Laksa served elsewhere in Malaysia; the broth is usually lighter as less coconut milk is used. Char Koay Teow / Char Kway Teow is basically fried flat rice noodles with prawns, cockles, egg, bean sprouts, Chinese chives, and chili paste. 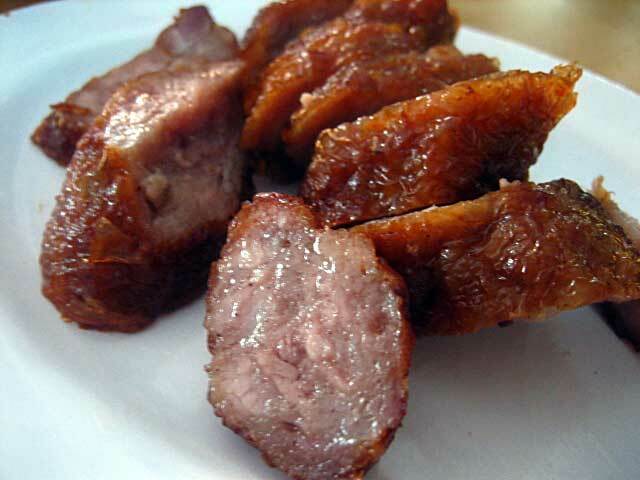 Sometimes, slices of Chinese sausage are added. 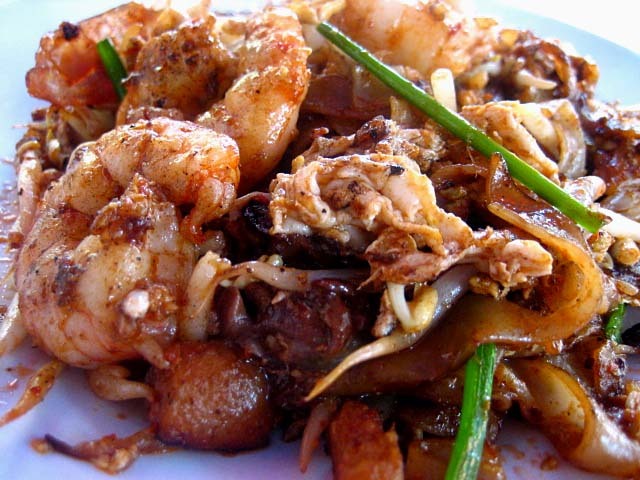 The best Char Koay Teow is usually fried with pork lard, which gives that extra aroma to the dish. There are two stalls outside of the coffee shop. Go for the one with a lot of customers. Afternoon. 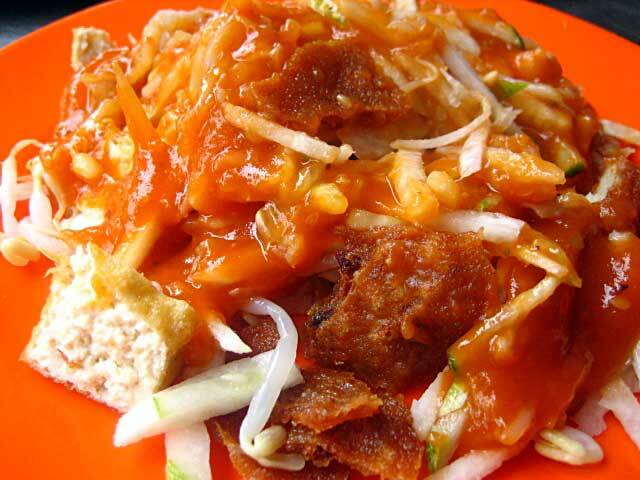 Rojak is a Penang-style salad. Ingredients such as cucumber, jicama, pineapples, jambu (water apple), bean curd pieces, and cuttlefish are tossed with Hae Ko (prawn paste), chili, roasted belacan and topped with ground peanuts. 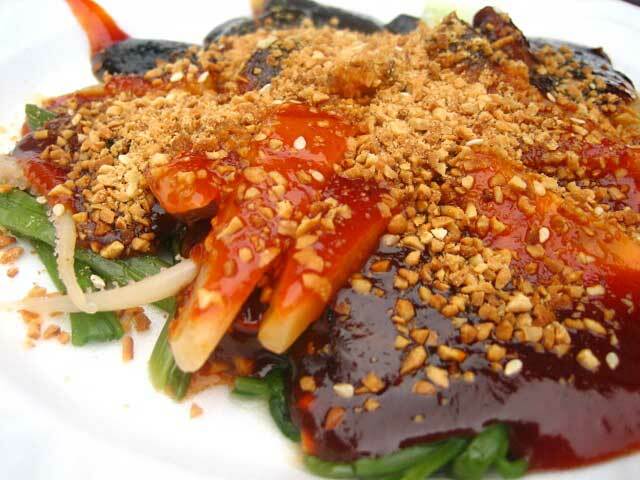 Another salad where blanched cuttlefish and water convolvulus are tossed with prawn paste, chili, sweet sauce, and topped with sesame seeds and grounded peanuts. This dish is very delightful. A must try. 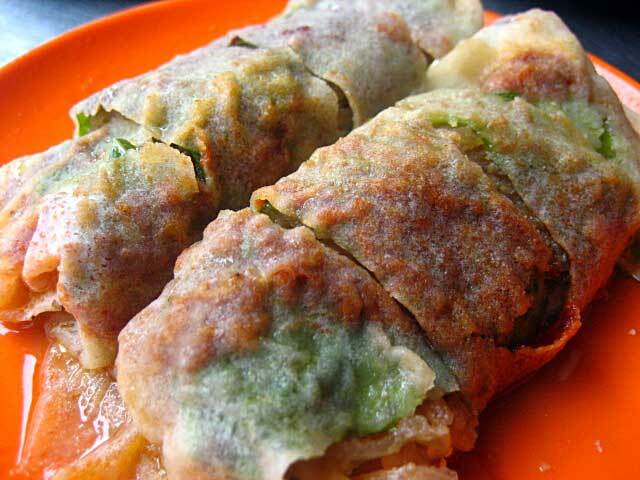 Filled with jacama (yambean), diced beancurb, and crab meat wrapped in fresh spring roll skin, Popiah is juicy and delicious. The best Popiah can be found at Padang Brown Hawker Center. Insider tip: order the deluxe Popiah with real crab meat instead of the regular popiah with artificial crab meat. One must not miss Grilled Stingray when you are in Malaysia. 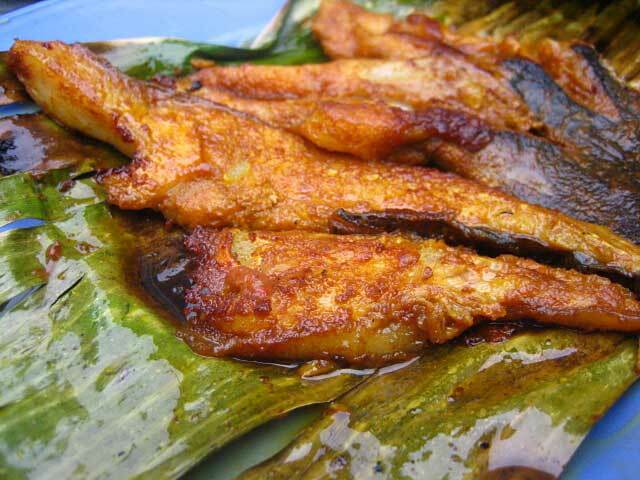 In Penang, Ikan Panggang / Ikan Bakar can be found at Chinese Kopi Tiam or Malay hawker joints. Other than Stingrays, there are other fish and seafood to choose from, for example: clams, squids, and other shellfish. 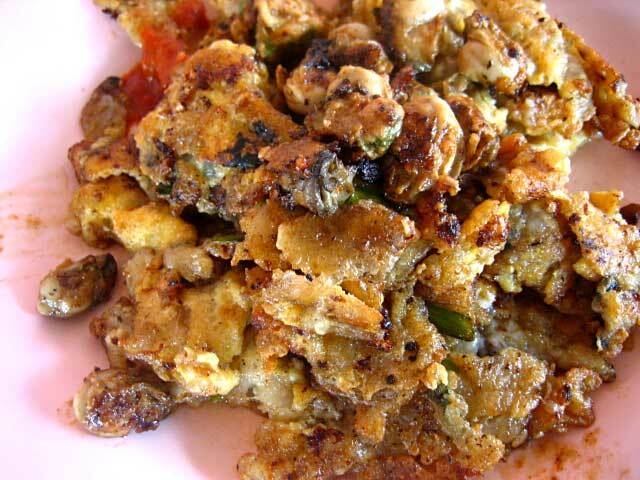 Originated in the Fujian region in China, Oh Chien is fried omelette with fresh oysters, with starch mixed into the eggs. The key to this dish is Wok Hei (breath of wok) as well as the generous use of fresh and succulent oysters. 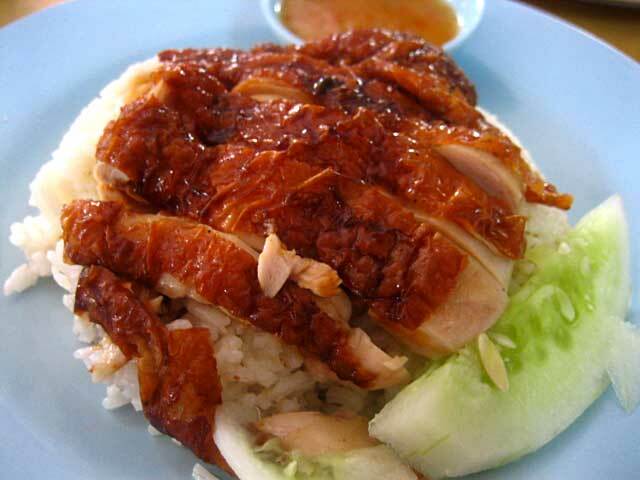 Chicken Rice is a very popular dish in Malaysia because it’s filling, delicious, and cheap. Other than steamed and fried / roasted chicken, you can also order barbequed pork, char siew, gizzards, innards, and other side dishes to go with the chicken rice. Otak-otak is a Nyonya specialty. 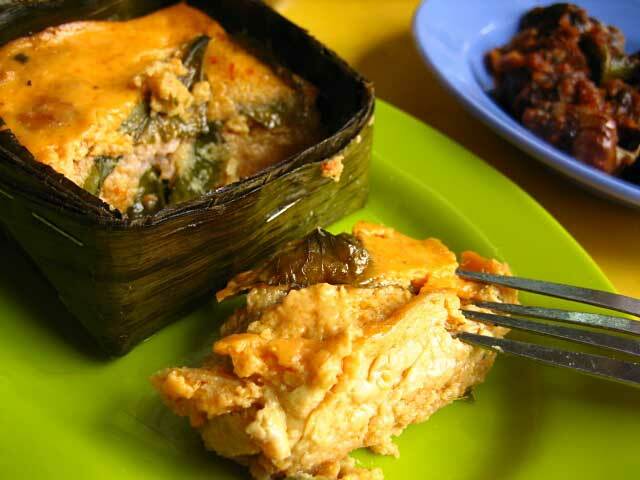 Wrapped in a banana leaf, Otak-Otak is basically spicy fish custard made of fresh fish fillets, eggs, and daun kadok (wild pepper leaves). Penang Otak-Otak is usually steamed while in Melaka and southern states, they are grilled. Both are equally delectable and it’s great as a snack. Loh Bak or meat rolls are wrapped in beancurd skin and deep fried to perfection. At Loh Bak stalls, you can also order prawn fritters (Heh Chee), fried bean curds, and other side dishes such as octopus, century eggs, etc. Loh Bak are usually served with two dipping sauces in Penang: chili sauce and a starchy sauce flavored with five-spice powder and eggs. 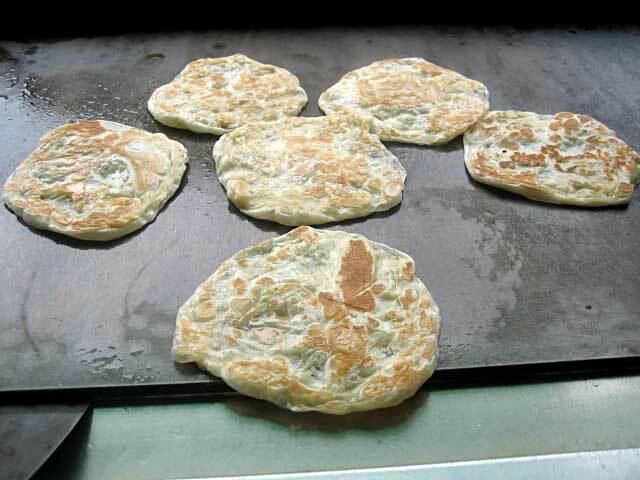 Penangites usually order a combo plate of Loh Bak, prawn fritters, and fried beancurb. Chee Cheong Fun is steamed rice rolls with oil, sweet sauce, and Heh Koe (prawn paste sauce) and topped with toasted sesame seeds, and fried shallots and chili sauce (if desired). Penang Chee Cheong Fun is very different from those served elsewhere in Malaysia. This is one of the must try hawker food in Penang. 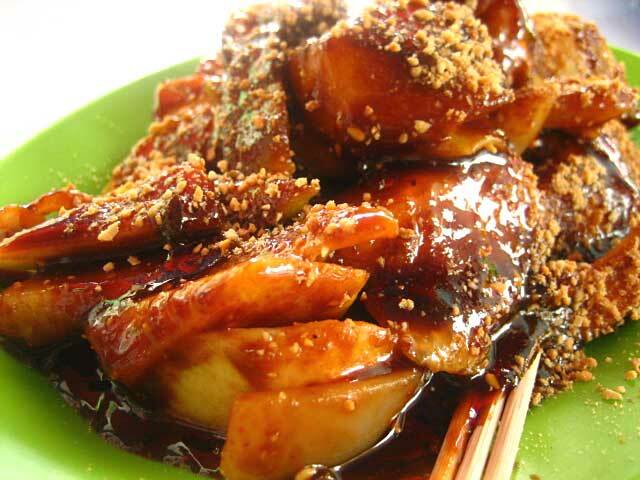 Cheh Hu or Chinese-style rojak is a healthy serving of bean sprouts, julienned cucumber, jicama (yambean), prawn fritters, beancurd, sliced jellyfish in a sweet potato sauce. This is one of my favorite afternoon snacks. 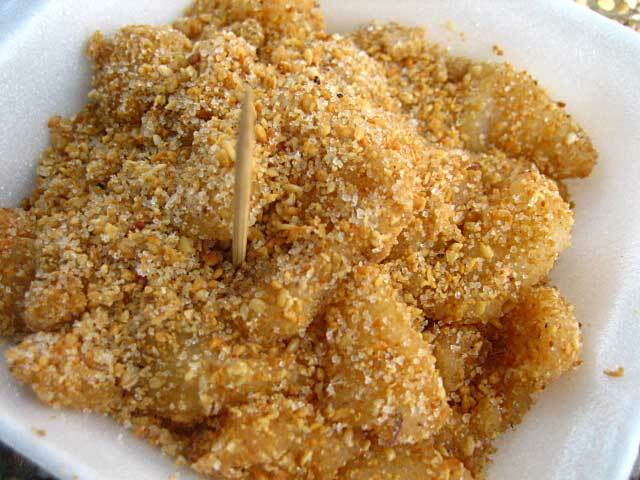 Muar Chee is a light snack consists of glutinous rice balls coated with grounded peanuts and sugar. As simple as it might sound to you, these little rice balls are very tasty. I crave for them every so often. 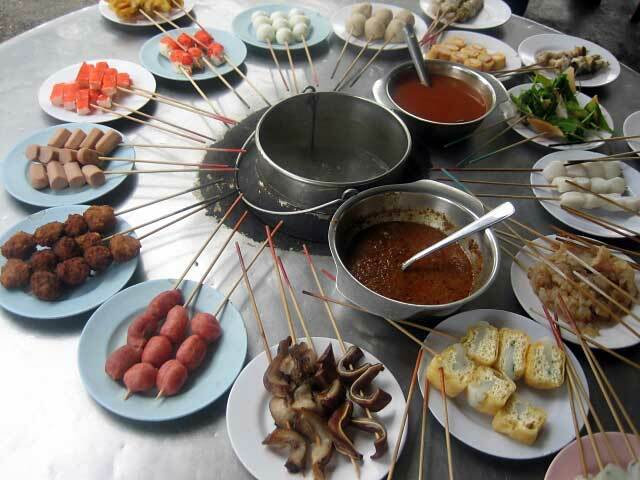 Lok Lok or fresh food in skewers with a pot of hot boiling water is fun to eat. There are two kinds of Lok Lok: sit-down Lok Lok where there is a table for patrons and stand-up Lok Lok where there is no seating. I personally like sit-down version because it’s just fun sitting down with a bunch of your friends or family members and have a communal dining experience. There are two stalls to choose from. Both are great, but with slightly different selections of food. 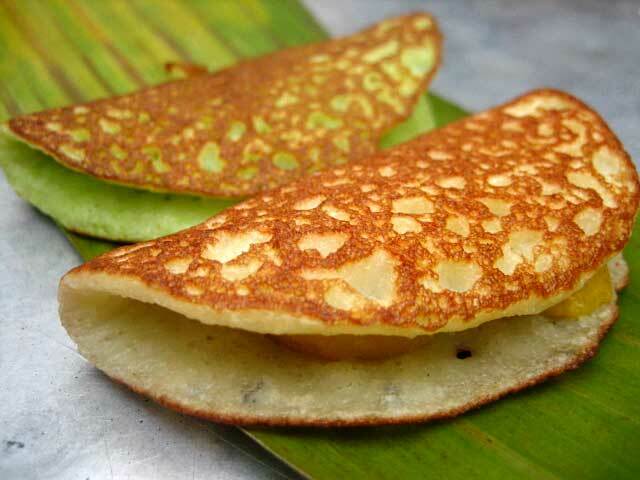 Apong Balik is a kind of Malaysian pancake filled with sliced bananas. Click on the link above and check out the picture; need I say more? Roti Canai is one of the best creations by Mamak (Indian-Muslim). This fluffy, crispy, and flaky bread is cooked on a flat iron skillet with lots of oil. Roti Canai is best when served with curries (choices include but not limited to chicken, beef, lamb, fish, or vegetarian). If you like your Roti Canai buttery, order Roti Bom or Roti Planta. If you like them with fillings, do try out Murtabak (filled with onions and beef) or Roti Pisang (filled with sliced bananas). Nasi Kandar is very popular in Penang. 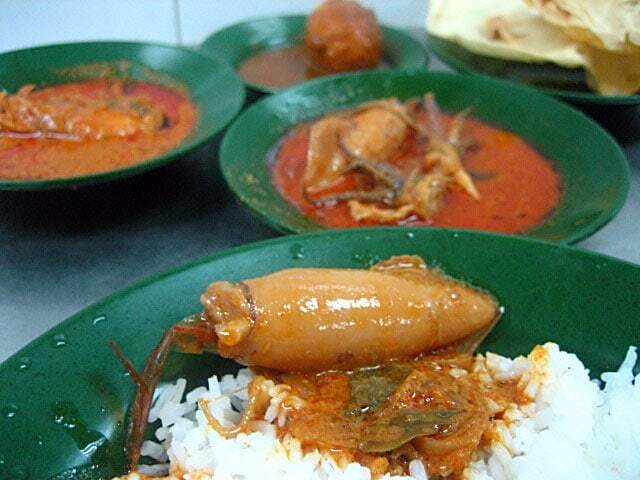 Operated by Mamak (Indian-Muslim), Nasi Kandar stalls or restaurants serve meals of steamed rice with a variety of curries, fried food, and other side dishes. I like eating my Nasi Kandar with a side order of Roti Canai, Papadam, and a glass of cold ice Syrup (a drink with pink syrup). Shaved ice with red beans, sweet corns, grass jelly, atap chee (the flesh from young seeds of a mangrove plant called Nypa Frutican) and jello. Sweet syrup and evaporated milk are generously drizzled over the shaved ice. This dessert is a great after a hot day in the sun. Nyonya Kuih are little cakes created by the Peranakans. They are colorful, delicate, and full of flavor and are best as a light breakfast or an afternoon snack. 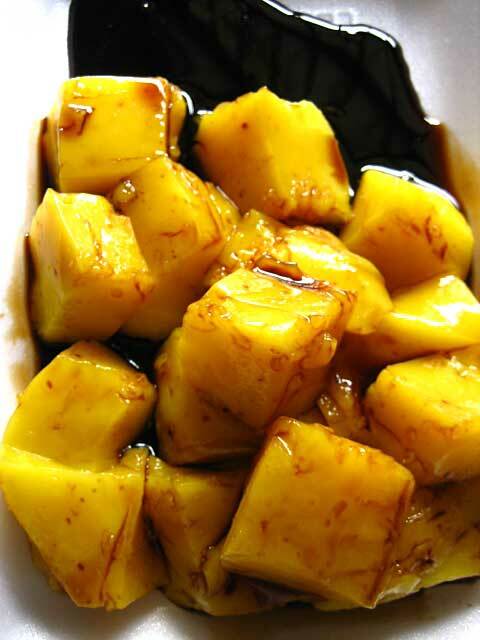 Tee Nya Kuih are rice cakes with brown sugar / palm sugar syrup. This Chinese delicacy is getting harder and harder to find these days. A must try. 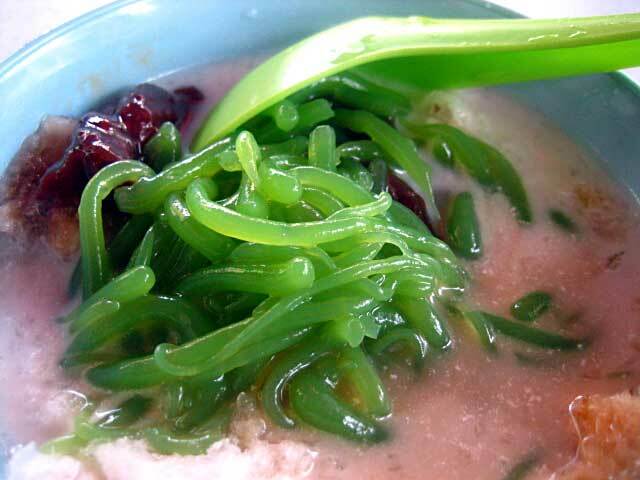 Pandan flavor is also available. 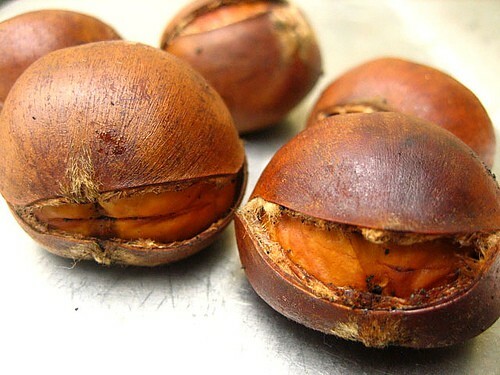 Roasted chesnuts were my childhood favorite. They are sweet and addictive and I would always steal them from my late grandmother (it was her favorite too). Once you start eating them, you just can’t stop. There are two stalls in front Chowrasta Market. Both are equally good. While you are in Penang, don’t forget to try out fresh fruit juice in Kopi Tiam (coffee shops) or hawker centers. Starfruit juice is my favorite. You can also get fresh coconut juice. Have fun and eat well in Penang! I’m so glad you’ve started putting this list together! Robyn directed me here as I am heading to M’sia tonight and will be spending 2 days in Penang. We will definitely try some of these places and I’m hoping that you post the continuation of this list soon! It’s because of people like you that I am motivated to write this long list of recommendations. I will finish my post soon. Please stay tuned. In the meantime, if you have any questions, do drop me an email. I hope you have a blast in Penang. I am going to print this article and bring it along if I visit Penang again. I missed the Assam Laksa, Char Koay Teow, Curry mee……. I cannot really get good Penang Food in Singapore..The Assam Laksa soup here is too sour, the colour is too yellow and not enough fish inside. I can still remember my Penang trip with my good friends eight years ago…Can you picture three girls at the Air Itam laksa’s table with six empty bowls stacked up? Will u be featuring cross border Bkt Tambun ? I think they have exotic sea creatures the rest of the country cannot even imagine exist ! and also ‘end’ and ‘beginning’ of the world, wonder if they r still there ? Oh well, I just updated my list, so if you print this post out, it’s going to be as thick as a book. LOL! Tonixe – Yes, I know. Bukit Tambun is awesome…great seafood. I will have to go back to Penang again and do a complete report about Tambun and other great restaurants in Penang. Just want to drop a ‘lil info. The Oh Chien stall at Seng Thor is 3 generations old. Father & youngest son are manning it now while another son has just started 1 at New Lane Hawker Junction. 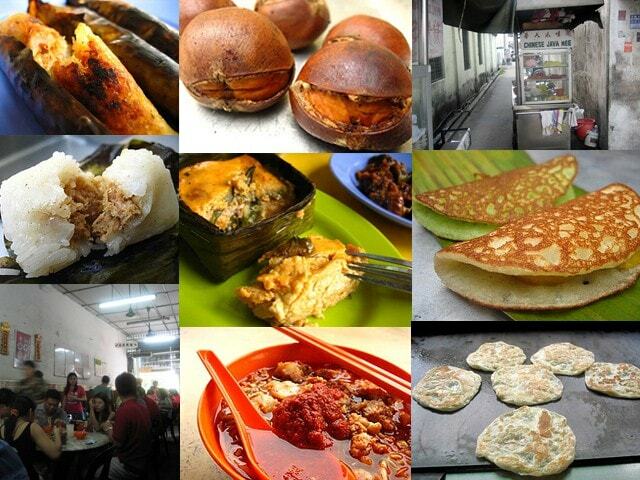 OMG, RM u are THE walking, breathing, talking Penang Hawker Food directory no one can leave home without! Thanks for that list it is realy helpful and i am definately going to use this list when i go out. hey the laksa at sa chew restaurant, they also sell lemak laksa, right? not many place nowadays sell lemak laksa. i like asam laksa but i do want to try lemak laksa once in a long while. Tummythoz – yes, I heard about that too. Somehow I still like the father’s version better. The son is not as good as the father. James – I will keep updating the list as Penang Hawker Food is not limited to what I have written so far. Chubbypanda – OC is hopeless. You will have to go to Penang. Lucia – Yes, all my favorite hawkers know me and recognize me even though I go home to Penang only once or twice a year. Yes, you are correct about Sa Chew. Laksa Lemak is great once in a while. 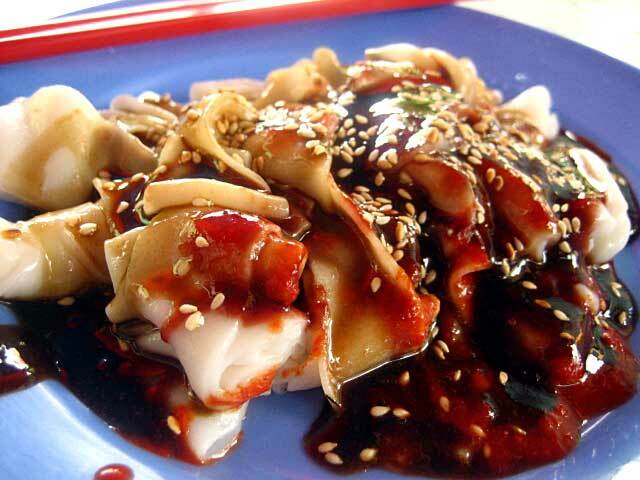 Another place to try Chee Cheong Fun – Genting coffee shop in Island Glade. Hi can you recommend a good place to have penang nasi lemak by which i mean nasi lemak penang style with assam prawns or fried fish?? I had some years back that a penangite friend bought me but never found out where he got it from! Please try the following, accordingly to Tourism Penang website. 1) In front of the Standard Chartered building in Beach Street – mornings only. 5) Coffee shop opposite Plus Zone in Pulau Tikus (lunch time only). Ms. Rasa Melayu, Sa Chew closed shop on Cantonment Road earlier this year and moved to pitiful little shophouse on Dato Keramat. I’m a true blooded Penangite and I will endorse your list as authentic. Please include Kueh Kaak which is one of my never-miss favourites. The curry mee stall at Bee Hooi Coffee Shop has moved to a coffee shop on the ground floor of the Relau low cost flats. There is another good curry mee stall at Cathay coffee shop, Burmah Road.It only operates at night on Monday to Friday. The coffee shop is opposite SRJK(C)Union near the 7th Day Adventist Church. Wonderful post – thank you so much! My grandparents used to live in Penang, and we visit every couple of years (we had our honeymoon there too). I’ve been looking for a definitive list of hawker stalls for ages, and I was delighted to find this post – thank you so much! We’re back in Penang in September – only four months to go! Wish I’d had this before our visit to Penang years ago (maybe 1995?). We did get to a few of the hawker stands, and I ate mee goreng everywhere, trying to figure out the recipe (which of course was a bit different at each place). My husband got into ice kacang, too — and we both ate lots of laksa and roti canai. Yum! 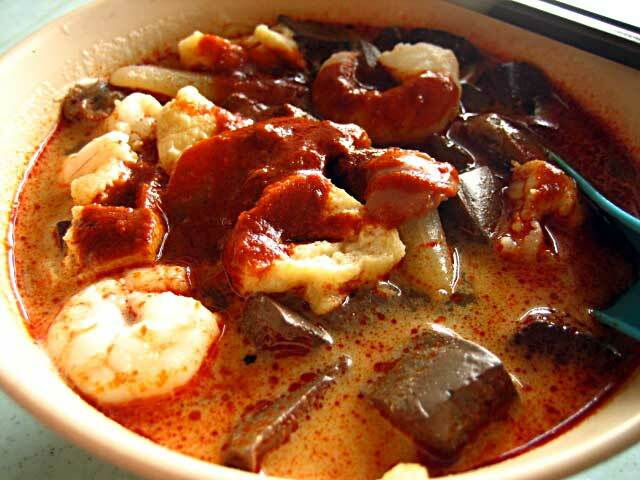 hello there, i am an avid fan of char kuey teow and curry mee…so can u recommend stalls of them that are halal and wickedly good in Penang? thanx! the satays at Balik Pulau( behind the market)are delicious too!!! the cheapest satays in Penang!!!!!! 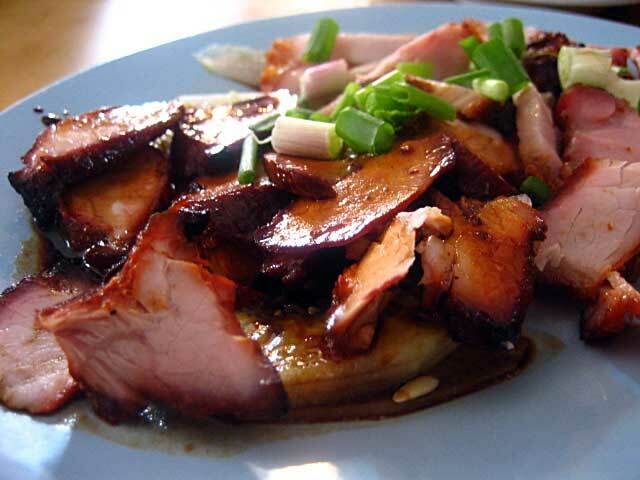 We travel to Penang regularly in search of the most delicious food in Penang. We went to Penang this year in June 2007. We are thinking of renting a car in Penang during our next makan trip in 2008. Can you recommend a cheap, good and reliable car rental company in Penang? Thanks a lot. aiyo. this looks like a chinese food listlah. can make one more malaysian ah? Tell me wat u think on it? we will be in Batu Ferrenghi for a week. could you PLEASE reccomend some good places to eat. I’ve been there before and most of the restaurants cater for western tastes and are not too authentic. i also hear alot of restaurants are closing down in batu ferrenghi is this true? 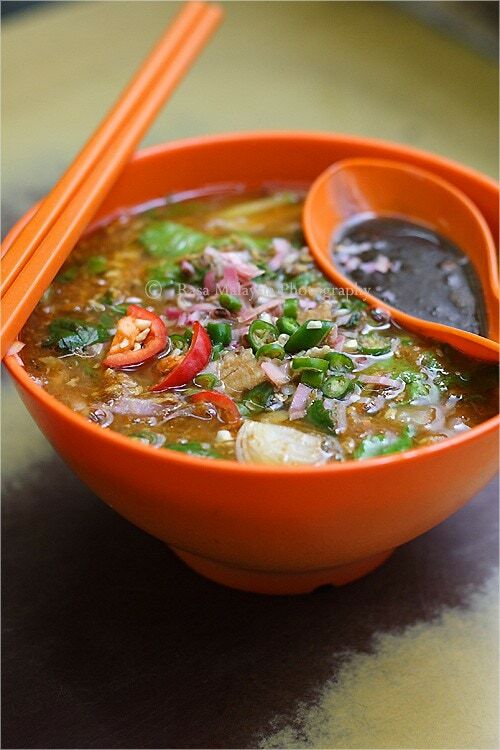 Daniel – if you want, you can buy this Penang hawker food cookbook published by The Star. 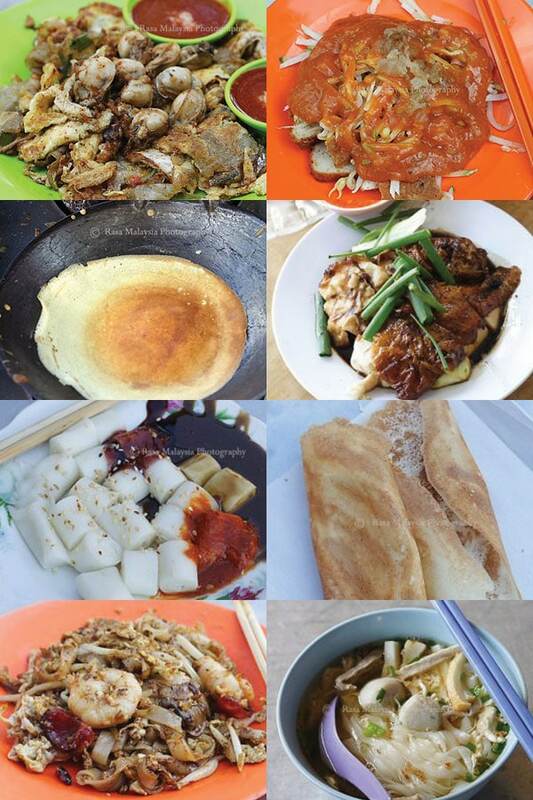 All the recipes are provided by the famous hawkers in Penang. I am based in US and can’t get many ingredients to make hawker food. If you haven’t been back to Penang for 30 years, you should definitely go back. It’s just 1 hour flight away from Singapore. Nothing beats being back to your own home and root and eating at the places you grew up. My recipes will never do enough justice to good foods available in Penang. Time to go back Daniel. What are you waiting for? Lately Star just intro Genting Coffee Shop Hokkien Mee and Chee Chong Fun, i tried that, pretty delicious. The chee chong fun, the paste is so special where can’t find this feel else where. While for hokkien mee, the soup is pretty thick. you can feel the freshness of the prawn soup…. very delicious. Could you add in one more stall as a recommendation for the best “mee suah kor” stall located in a cornershop in between the junction of Jalan Burmah and Lorong Pulau Tikus. My girlfriend love this ” mee suah kor” so much but because its not so high profile and not known to many ppl, so my gf is afraid one day the stall will close down. AS for the shop’s name,i can only let you know when im going to penang tomorrow. hi your information on local eateries are very helpful. We are going to Penang during Chinese New Year holiday. Will those hawker places stay open during the holiday? Thanks a lot. hello.I want ask some question about hawker food. can some body plz help me? The list looks good. I can’t wait to enjoy all these foods when I’m back in Penang. You should draw up a map or list of food according to the geographical order of where these food stalls are. Something like a ‘food journey’. It will definitely make things easier for tourist. The best Assam Laksa in Penang is at Hot & Spicy Cafe, Jalan Air Itam main road, opposite Public Bank Air Itam branch, in front of the old Choong Nam cinema (now a church), just a few doors away from Shell petrol station. It’s many times better than Air Itam laksa!!!!! Just RM3.00 per bowl. It’s yummy, yummy, yummy. 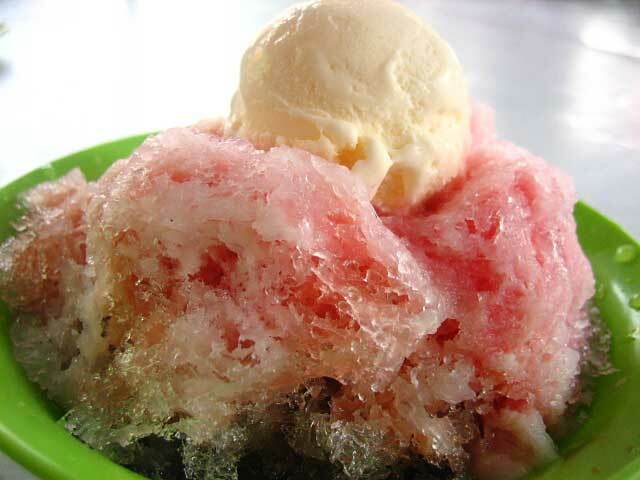 The stall also sells yummy Ice Kacang & Ai Yi Bing (Taiwanese jelly dessert)!!! I was born and brought up in Penang. I now live in UK. I love the food.in Penang and i return so oftern just to sit near the sea and have a great.meal. Penang is my heaven.